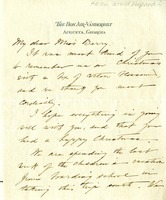 Helen Gould Shepard writes to Martha Berry, thanking her for the Christmas gift of cotton blossoms. She goes on to speak about her family's Christmas holiday. The children are on vacation from boarding school, so the family took the opportunity to take a trip South, visiting Washington (D. C.) en route where she spent a few of hours with Mrs. Walker, the Chairman of the recently formed National Defense Committee of the Daughters of the American Revolution. Mrs. Walker has apparently compiled an "important collection of radical literature." Currently Helen Shepard and her family are enjoying the remainder of their vacation in Augusta, playing golf at the country club. She also encloses a few papers that she believes Martha Berry will find interesting. 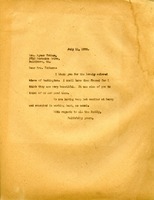 They have been translated from important public documents, which Shepard requests that her name not be connected to in any public address that Berry may give.